Not only was the Dogwood Track Classic filled with 240+ Nationally Elite Performances but it also had some really good teams there as well. Winning the team titles for the girls was Bullis with 47 points and Atlee for the boys with 50.5 points. Individually things were just as exciting. In the short sprints Cole Beck lit up the track with his 10.43 winning performance in the 100. When they added the hurdles to the track it was then Masai Russell's (13.80) and Nickolas Child's (13.96) turn. Russell's time was one of the fastest in the nation and Child's was just .02 off of the 42 year old meet record. In the other hurdle race it was Emmanuel Waller once again showing his stellar speed with a VA #1 37.41 performance. In the much longer distance races there were six performances worth noting. The first of which was on Friday and that was Ryan Brown (NC) in the 2K Steeple. His 6:03.48 was not only a meet record and US #2 time but also a NC State Record. Also running well for the guys in distance events was Jake Renfree (TN) winning the 1600 in 4:08.11, Sam Affolder going sub nine in the 3200 (8:59), and of course Theo Woods with his 1:52 800 victory. The star of the girls' distance races was Mary Caroline Heinen of Maggie Walker who won the 1600 in a quick 4:51 and the 3200 in 10:44 to take over the state lead in both events. In the field events things were even more exciting. 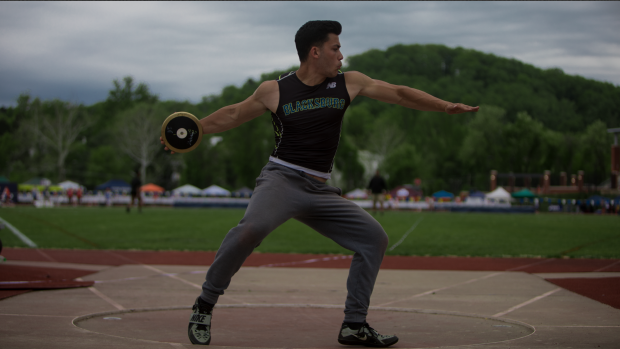 We had Blacksburg's Solomon Ghosh launching the disc and James Monroe's Alexis Clark taking home victories and meet records in both throws. Westfield's freshman star Emma Seetoo also had a huge day with her win in the long jump. Zoe Rice cleaned up shop in the triple jump as both made a strong case to pick them heading into the post-season. Finally in the relays we saw Loudoun Valley and Albemarle win the DMR's, Grafton and Atlee win the 4x8's, LCA and San Francisco win the 4x4's, Forest Park and John Champ win the 4x1's, and E.C. Glass and Herndon win the SMR's. E.C. Glass' victory in the guys SMR (3:27.49) was a US #1 performance.